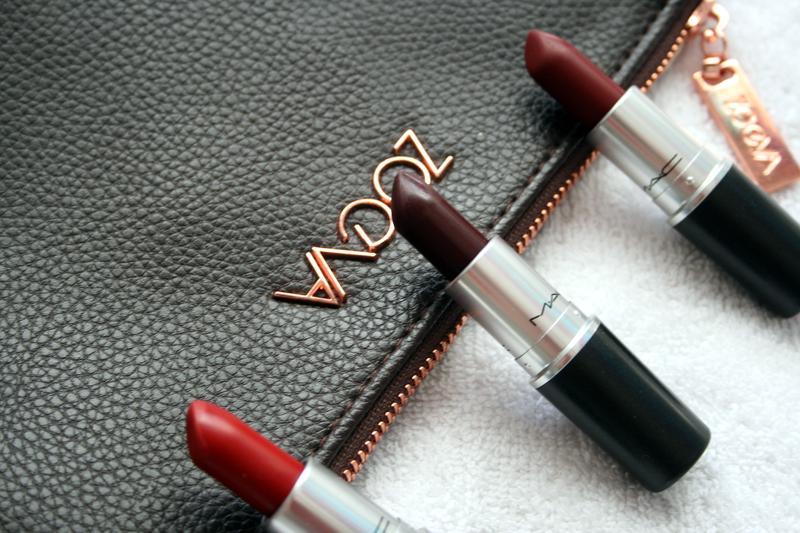 L - R Russian Red, Lingering Kiss, Hearts AFlame. When it comes to Mac lipsticks my collection only goes as far as three, I know I know it's a bit ridiculous for someone who loves Beauty products to only have three but it just was something I never spent my money on as I would much rather spend it on drugstore makeup products and get more for my money. However the three I do have in my collection are three colours I do adore. 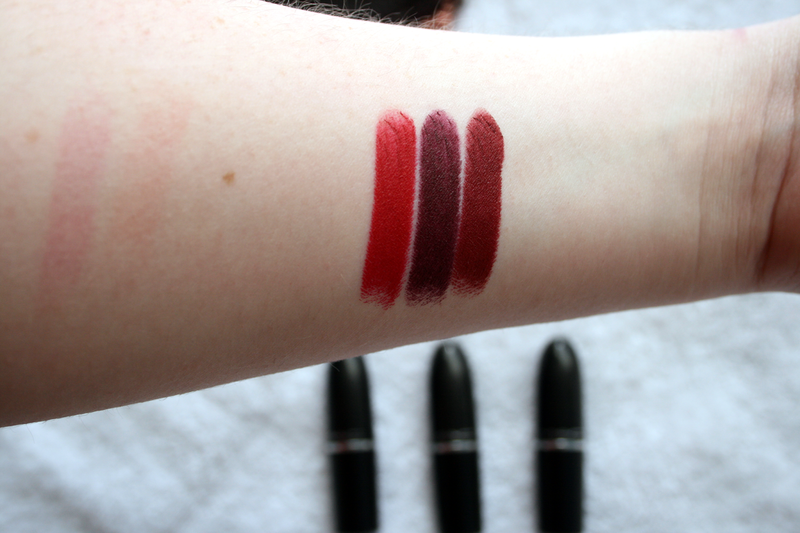 One thing I will say is when it comes to lipsticks I am not a lover of matte finishes which is a bit strange to say considering the three Mac one's I own are all a matte finish. However I don't find that these dry out your lips too much. I also don't wear these lipsticks as much as I'd like too as I just think the colours are very wintery/dressy. Is that a strange way to describe a colour? Russian Red This is definitely my perfect Snow White red and if I am getting all dressed up for an occasion and want a red lip this is the colour I pick up. Although I find that's the only time I wear it as I think the red is too dressy for everyday wear?! Thats just my personal opinion but I think because I know it's Mac I'm like oh no, I need to keep that for occasion wear only. I was actually lucky enough to win this in the lovely Sophie's blog giveaway last year. Like I said the colour is absolutely gorgeous and because it's matte you don't exactly have to wear a lip liner with it but can if you want to define your lips more. I do hope I can shake off the feeling of calling this 'good wear' as it's so pretty and I do love when it's on. Also the staying power is pretty decent and it makes your teeth look mega white!! Lingering Kiss This is definitely one of the shades I class as a Winter shade as it's a gorgeous deep purple shade. When on the lips it's almost a black purple it's that dark which I absolutely adore in the colder months. I won't be getting much wear out of this anytime soon but when I do get to wear it, it's such a statement look! Again because it's matte a lip liner isn't exactly needed unless you want to define your lips a little more. As this shade is so dark I do always tend to wear a neutral eye look but sometimes the more dramatic the makeup look the better in my opinion. Hearts AFlame I bought this one at the same time I bought Lingering Kiss because I always told myself that the first Mac lipstick I would buy would be a red shade. I'm not sure why I always told myself that but I did. When I seen this one I just thought it was a gorgeous dark and deep colour I had to get it. (Can you tell it was during Winter months I bought these two colours?!) Definitely not your average red colour but personally I class it as a vampy red because of how dark it is. When it's on, it looks absolutely stunning and with a smokey eye...sorted!! I would love a shade like this not in a matte shade because is it just me or do matte lipsticks sometimes hurt your lips? 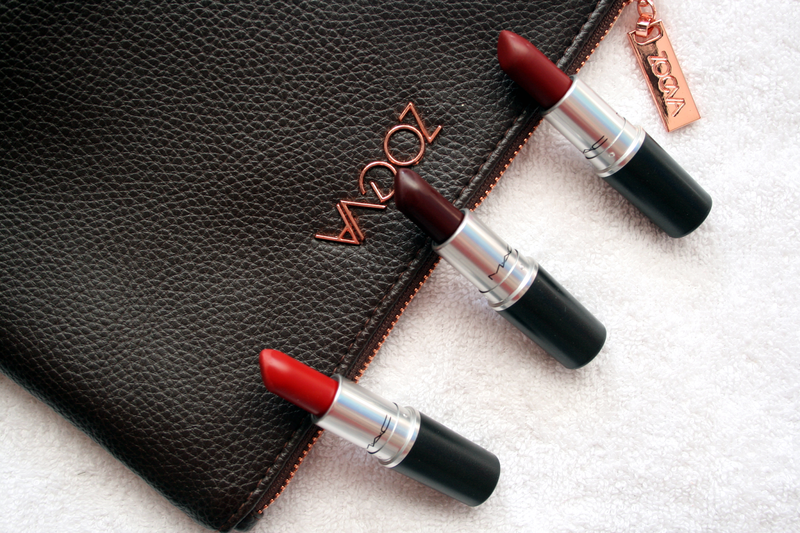 Overall I do adore all three and don't wear them as much as I would like too but because they are matte I just have to be in the mood to wear them, and also because I've classed them in my mind as too dressy or wintery they're not ones I pick on an everyday kind of day. I do understand the hype about Mac lipsticks though as they are stunning on and the quality just couldn't be beaten. I do want to try other finishes from Mac and will hopefully do so soon. These lipsticks retail between €17.50 - €19.50. Probably not the kind of money you want to spend if you are on a budget put I can promise you once you try one and see the quality you won't mind paying the money! What's your favourite Mac shade?